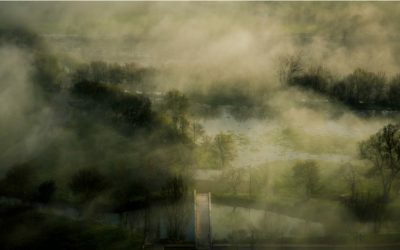 This cloning project originated from the lab of a new researcher located at the main campus of Université de Montréal. 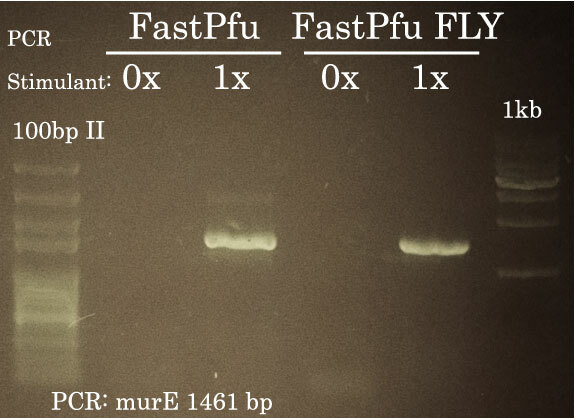 It consisted in optimization of PCR conditions for the amplification of murC and murE from Pseudomonas aeruginosa. 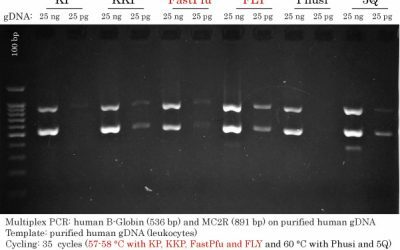 Cloning primers were designed by the customer in order to perform High-Fidelity PCR Amplification from Pseudomonas gDNA. 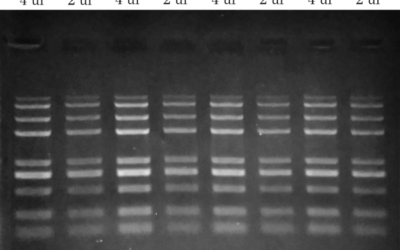 Pseudomonas aeruginosa genomic DNA was extracted from 1 colony with TransDirect Animal Tissue AD1, AD2, AD3 buffer set but was not purified. 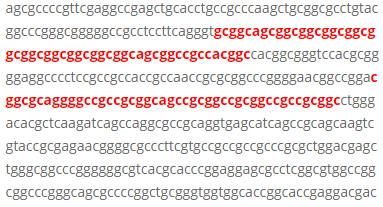 The murC gene has an overall GC content of 67% GC with some segments reaching 75% GC. 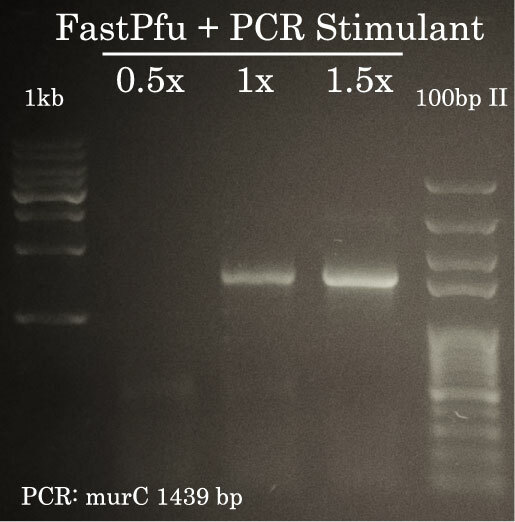 TransStart FastPfu was used to amplify murC from Pseudomonas aeruginosa genomic DNA. 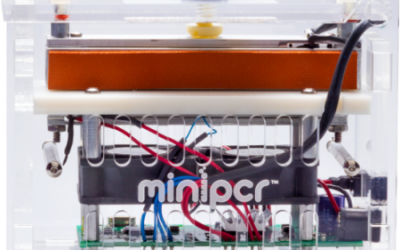 As illustrated here, successful amplification necessitated the addition of PCR Stimulant. 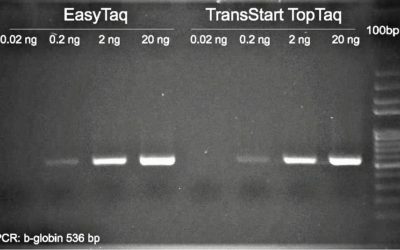 1.5 ul of the PCR reaction was migrated on a 1% agarose gel in TAE 1x. 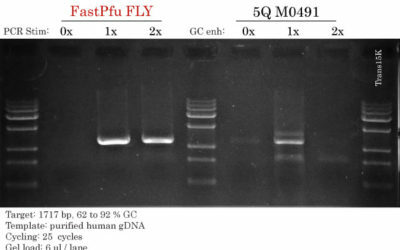 TransStart FastPfu was used to perform High-Fidelity PCR and amplify murE from Pseudomonas aeruginosa genomic DNA. As illustrated here, successful amplification necessitated the addition of PCR Stimulant to 1x fnal concentration. 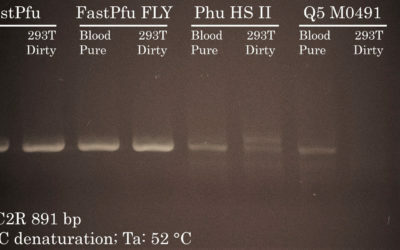 1ul of the PCR reaction was migrated on a 1% agarose gel in TAE 1x.